On Baby Head-Shaving And Why I Don’t Support It | SesapZai - Mom. Artist. Academic. And a little bit of everything else. Upon hearing that, Sania’s jaw literally dropped open in shock. The discussion about shaving my baby’s hair continued on for a few more minutes, until my husband and his partner came out of the office, and I breathed a sigh of relief as the said topic was diverted to something else. I was especially glad that I didn’t have to stand there anymore, uncomfortably, and explain why I haven’t shaved my daughter’s head, despite it being religiously or culturally obligatory, without having to hurt this really nice woman’s feelings. I mean, I’d just met her and her kind husband, and I just didn’t want to come off too headstrong over something that they clearly had very strong sentiments over. And that’s fine. Everyone is entitled to their own actions and preferences. I just choose not to go with the cultural/religious norm of shaving my baby’s head and I will explain why as this post progresses. It appears that in numerous cultures (and religions) around the world, head-shaving of newborn babies is quite common; from China to India (and the surrounding South-and Central-Asian countries) to Mongolia to Africa. And while in some parts of the world, especially in Muslim-majority ones, shaving of a baby’s head is Sunnah, in other places it is culturally practiced and even seen as a rite of passage. In fact, her hair was so gorgeous that all the nurses and the doctors at the hospital kept telling me how they’ve never seen a baby with that much beautiful hair; it was so surreal and incredible. However, despite the superficial and lack of significance aspect of refusing to shave my baby’s head, both my husband and I also didn’t see the logic behind it. We also rejected the claim that shaving a baby’s head would result in the hair growing back thicker and healthier — a myth that desperately needs to be debunked because hair grows from a follicle beneath the surface of the scalp. So, what we do to the hair on the outside, or the surface, has no effect on the hair that is developing on the follicle. Also, it’s common — very common actually — for babies to lose some or perhaps even all of their birth hair by the time they are around 4 or 5 months old. I know this because I noticed my daughter shedding a lot of hair in her bassinet when she slept at night. I also know this because around 4-5 months of age, my daughter’s hair texture and colour began to change drastically. 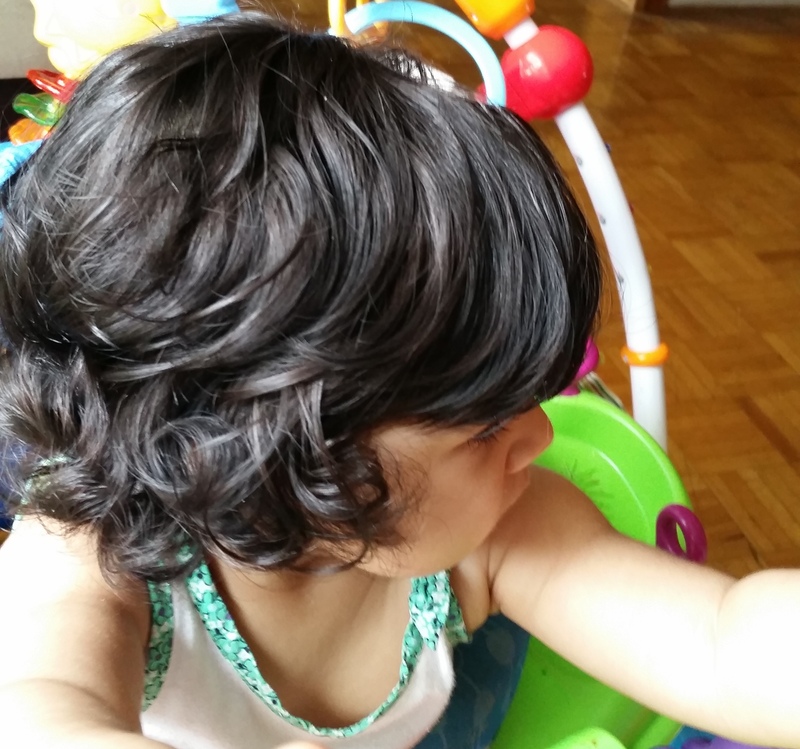 From being ultra straight, cotton-like and jet black, my daughter’s hair had suddenly become curlier, silky and lighter in texture and tone. To put it simply, my daughter’s hair, without my having to shave her head, had become even more gorgeous than ever. And, now when you see her hair, it looks nothing like when she was born. Mind you, we did occasionally trim her hair, mostly her bangs, because they would keep falling in her eyes and would bother her, and trimming your baby’s hair might actually make it appear thicker, just like ours does when we get a trim. This is because we get rid of the excess split ends and the unhealthy hair at the bottom, which makes room for new and much more healthy hair growth. But, yes, other than trimming, we’ve never touched our daughter’s hair so as not to ruin it. And never will, unless she wants a nice, trendy hair-cut, of course. Thus, many people need to understand that head-shaving does not contribute to hair growing back thicker or healthier, because whether we shave, trim, or brush our baby’s hair a hundred strokes a day, it really won’t affect how it grows in. That’s up to genetics. Genes decide the colour and texture of our hair, not shaving. However, I understand why some people feel the need to shave their baby’s head, especially if they see that their baby’s head has developed a bald patch or that his/her hair is growing unevenly. But, to shave a baby’s head, just for the sake of believing it to grow back “thicker and healthier” is just silly and nonsensical. Also, I should have added that another reason why some people choose to get rid of their baby’s birth hair is because of the fact that it was permeated in blood and amniotic fluid. And, believe it or not, but I actually knew of someone who said that she found birth hair “disgusting” and “unhygienic” and that the sooner we shaved it all off, the better it was for the baby. Mind you, at the time of this conversation, I didn’t have kids (or a kid) yet; heck, I wasn’t even married even. And, yet, what this girl had said sounded crass and quite insolent. How dare she make the assumption that baby hair that was floating in amniotic fluid is disgusting? I couldn’t help wondering, at the time. I mean babies, too, live and float in amniotic fluid for nine whole months, so how come we don’t find them gross or disgusting? You see the lack of logic in this insensitive argument, dear reader? We all know that as soon as babies are born, the nurses quickly wash and bathe them, ensuring that any or all signs of blood and the fluid has been cleansed away, leaving the baby smelling beautiful and fresh. From their hair to their skin to pretty much everything, newborn baby smell is absolutely wonderful. Those who’ve had or been around newborn babies know exactly what smell I am talking about. The smell barely lasts two weeks, but it’s the type of smell that you become addicted to and long for. And there is absolutely nothing gross or disgusting about a newborn’s hair, just like there is nothing gross or disgusting about your baby having lived in amniotic fluid. So, let’s not be like that person I knew, back in undergrad, and say/assume something that is so obtuse and thoughtless. However, at the same time, while many people are huge fans of shaving their baby’s head right after birth, for whatever reason it may be, they have to be extremely careful, as the baby’s head is very delicate and sensitive, and they will need to go to an expert to do the shaving. Otherwise, if people use a simple razor, they fall at the risk of cutting off a layer of skin containing hair follicles, which may result in the baby being bald for a very long time — perhaps as long as 2 or 3 years of age. So, not only is shaving a newborn’s head, in my humble opinion, illogical but it is very dangerous and risky as well. Anyway, my point in writing this blog post is this: To each his or her own. If you want to shave your baby’s head, because it holds significant meaning for you. Good. Go right ahead. However, please, please for the love of science, adorable babies, and pretty shiny things, do not force and tell other people to do the same thing, especially if they don’t hold the same values or sentiments as you when it comes to baby head-shaving. It should, and needs to, be a personal thing. Limited to personal preference only. So, no matter how much someone tells me, or anyone else who is against the whole head-shaving idea, to shave our babies’ head, we won’t. We won’t do it. And there is nothing such people could possibly tell us that will change our minds on the matter. Nothing at all. Aaah you hit an interesting topic especially if you are from Pakistan. I experienced this dilemma twice. Once with my son and then with my daughter. Both had thin hair on birth, especially my daughter. Golden, curly light hair. As it turns out my hair was exactly the same so my mom and grand-mom had my head shaved a couple of times. I believed that this was just a myth but my heart told me to go for the shaving bit. What’s the worst that could happen? So I confess. Both my children had shaved heads. and Well now they have awesome thick curly hair:). My story ended well. I agree with your scientific backing, but in my case shaving did wonders. So I guess we all have our stories:). Thank you so much for your comment 🙂 And, also, thank you for sharing your story/experience with baby head-shaving. Well, see, I can understand why babies initially start off with thin, wispy hair, and regardless of whether we shave it off or not, the fact of the matter is that the baby will most likely shed that hair. We, humans, are always shedding hair. It’s not only limited to babies. I am sure you noticed how gorgeous your hair got when you were pregnant. The texture and colour probably even changed it. Mine surely did! In fact, the change was so drastic that I couldn’t believe that that was actually my hair! I have naturally wavy/curly hair and for once in my life, I never had to blow-dry or straighten my hair. And it was like this ALL through my pregnancy. However, it was only after I gave birth that my hair drastically changed. It became dull, lost its bright texture and don’t get me started on the shedding! It was a nightmare! yeah, but you don’t know what would have happened if you *hadn’t* shaved their heads. so “it worked out” isn’t saying much. sure, it “worked out”. would have worked out the same without shaving. that’s the science. Thank you so much for your comment! I am so glad you found this blog useful 🙂 It’s been something I’ve been noticing and pondering over for a while, and when I finally had my own child, it had gotten to a point that it just didn’t make sense to me to shave all that prettyful hair. It just makes me laugh how shocked and horrified people get when I tell them I never shaved my baby’s head; more so with brown peeps/desis. I was talking to some close Asian (Chinese) friends of ours a couple weeks ago — a couple, who are hoping to have their first child soon — and the topic of head-shaving of babies came up, and I asked them curiously whether it was traditional for them to do that too, and they just laughed and told us (my husband and I) that they *used* to do that, like WAY back in the day. Wayyyyy, way back! And that it’s now considered “backwards” and “ancient,” and that no one (Asians) do it anymore. I just couldn’t help smiling widely at that. I mean it’s NICE to see how much people have progressed over time, you know? I mean, if someone REALLY wants to do it, sure, but I feel it shouldn’t have to be forced/imposed or seen as obligatory. And I am so glad that you, too, don’t intend to shave your son’s head. Many congrats, by the way! How old is your little one? First child? I look forward to reading more comments from you, my dear. Also, do you write or have a blog too? Your post came up while I was googling shaving a baby’s head. I appreciate your input on the matter 🙂 It makes me feel better about my justification on why I would not be shaving my daughters hair. I don’t even want to cut it (ever) haha but I understand there will be times when it absolutely needs to be cut! Thanks a lot for this blog on shaving hair. Shave my 4 months old daughter’s hair or not? problem I had was detangling her hair but conditioners helped me to managed it then. to shave her hair bcos back in Africa where I came from, I use to see most new born baby hair been shaved so when I asked a friend here in europe she told me that its good to shave the 1st hair that the baby grows while in womb so on that note I decide to shave her full thick curly hair by then she was about 3yrs old. And guess what, when her hair grows it was still thick and full but it wasnt as curly and tender as it use to be. Maybe I shouldn’t have shaved it but rather trimmed it instead. Now I had my 2nd daughter she’s 4 months old and she has a full thick and curly hair and I didn’t want to shave it like I did with my 1st daughter but I needed to know if there’s other parents who thought like me at least to enconrage my idea and while I was searching the net I came across ur blog and its quite educating and encouraging to know you did tried it . So on that note i still not shave my baby’s hair rather I will be trimming it when its needed. Also her hair helped her to keep warm this winter season when i didnt remember to wear her hat. The sunnah is to shave newborn hair (below 7days) for hygenic reason (logically back then giving birth process wasn’t as sanitary as now) and the weight of hair is equal to how much the parents should donate to the poor (as a symbolic of gratefulness). It’s a sunnah, which means it is not compulsory, but doing so means you are doing good deeds. Other than that, it’s merely cultural beliefs that doing so will grow “better” hair. Obviously the hair is going to grow at the same rate, it just seems thicker with blunt ends and looking a little bit even. It’s really up to the parents, but I really don’t understand why certain parents say it’s a must, it’s a sunnah, and insist other parents to do so, when they themselves fail to understand the meaning of this ritual. I am tired. I’m just glad I’m not the only one surrounded by sheer idiots – apparently having a functional brain is neither common nor easy. I am a daycare provider in the United States, we normally only shave our kids head if they have something in their hair such as gum or lice or it’s really hot outside. So today when one of my daycare kids from Nepal arrived with a freshly shaved head I was surprised, specially since the child is a girl. It’s November, almost winter, I thought to cold to be shaving her head. I never knew about this practice so I had to google it. Thank you for sharing, I enjoy learning about other cultures. Hi, I cannot be more thrilled to read someone who echoes my exact thoughts. Your article is such a breather among the bunch of brain dead species I have in my life who are following so called traditions without any valid medical or scientific reasons. It is so true and basic that the hair shoots out from the follicle and shaving off the head has nothing to do with the texture or thickness of the hair it is a coincidence that some babies grow thick hair after being shaved AGAIN it has no scientific validation! But who do you want to really debate with a bunch of incessant fools? And just like you I exactly believe each to his own – I respect other people’s views so why cannot they respect mine? You go ahead do what you want to do with your baby but please do not force me to shave my babies head as in my opinion it doesn’t benefit my baby in any way. If it benefited my baby nutritionally, physically or mentally I would be go ahead with it happily but it has none of these benefits. Having said that you are very lucky to have a husband who supports with your ‘LOGICAL’ thought. For me it’s very tough because my husband sees no ‘LOGICAL’ or sensible reasoning to things he yells at me for having different ‘LOGICAL’ opinions and blindly believes what his parents order and demand about our child no matter how harmful it is for the little one. And surprisingly it comes from in laws who are themselves in the medical profession! It’s part of Saṃskāra, which are said to be a purification process. There are 16 Saṃskāra and Chudakarana (Mundan/First Hair cutting) is one of them. Some believes says birth hairs are undesired traits from the past births and this ceremony is used to set the child free from past birth. I just shaved my sons hair and I was so sad about it. He had such beautiful hair. He had a very bad case of cradles cap and it wasn’t healing right so shaving his head was a must. If u didn’t have to I wouldn’t had done it. Hey. Thank you for putting words to what my own thoughts were! Our baby’s head was shaved once post-birth according to sunnah and I was happy to do that. She was born with a head full of hair and within about two months all her hair came back. Now at 7 months, both grandparents are pressuring us to shave her head so “she will have better hair”! My MIL especially, who has not restrained her disappointment in my hair (I have brown fine straight hair), is the most ‘worried’ about my baby’s hair. My husband has nice thick black hair, snd just because the baby doesn’t have that hair, her head needs to be shaved over and over again. What bothers me the most is comments that my baby will grow up to be disappointed because she is a girl and she ‘needs’ to have thick hair! Ugh!! My baby was born with lots of fine hair all over her body, face and ear…most of which has fallen off as it naturally does but she still has some between her eyebrows. Don’t get me started on my MILs suggestion of rolling dough on her face to take that off because again my baby will have a hard time with a unibrow (it’s barely noticeable and I don’t care) as a girl. I just shaved my son bald @ 18 months. He was born with a full thick head of hair. I only shaved him becuase he wouldn’t sit still for a trim, and his 6 month old brother pulls his hair constantly. When he saw himself in the mirror after the shave the look on his face was priceless (grin from ear to ear). As for genetics vs shaving having an effect on hair growth there is no significant research to support either claim. My MIL is a Chinese and my poor baby’s hair was shaved. The nurse used a razor and it was a scary sight. I disagreed but they didn’t listen to me. They had it done during my baby’s first month. Now you can almost see the veins of her head. I really hate them for doing this to my baby. I know it is about tradition or culture, but the fact that I’m the mother I even got no chance to oppose. Why didn’t I read this? Ugghh now I hate myself. I shaved my baby’s hair believing that it will grow back again healthy and thick. 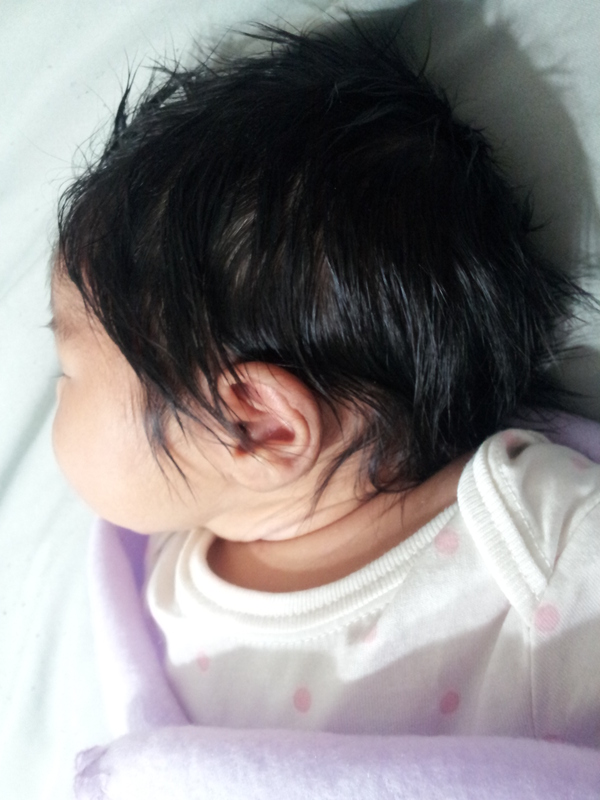 Few months ago, her hair starts to becoming bald at the front so I’m so worried that I think about shaving her hair off. Just this Sunday I decided to do it. And now I regret it after reading this. Hi! I came to your post cos I didn’t shave my daughter’s hair for over a year and my in-laws keep asking me to as she is too “dirty” to go into temples. Like my husband said, “then we don’t ever go to temples!” Although I thought the same way scientifically as you, I am not the type to tell them directly this way, so I am glad to gather your post as one of the few that I can ask my husband to show them, that we are not the only ones saying what we think is scientifically correct, but many people do too. So, thank you! I agree that shaving makes the hair grow thicker is a myth. I have seen men with puny moustaches that try to get it thicker but to no avail. I shave my legs and armpits a few times a month and the hair that grows back remains at the same level of thickness. I shaved my daughter’s head for religious purposes and the thick black hair she had when she was born, grew back. So in conclusion, unless you are Muslim following sunnah, or your baby became a Buddhist monk, then it’s not necessary to shave their head. And thinking it will grow back thicker means you believe whatever you hear and should perhaps think on your own and do some real research. There is no way you could shave deep enough to get to the follicle and delay hair growth by several years. If you ever cut that deep your child would be in the hospital with a serious wound. Omg..I am very happy that there are at least some people around who echo my thoughts..my daughter is 5 month old and my in-law suggested shaving her hair..since those hairs are related to sins of mine..such an illogical concept..got some strength after reading the article. Thanks to the author. Will fight with the society for not shaving my daughters hair. Occasional trimming is fine..if required. My baby is 3 months old and she has exact same hair at time of birth. Black long curly hair and I don’t want to do mundan of her. Thanks for this article, I was searching for “is it good to shave baby’s head” and came to here, our culturer ridiculous belief is to shave hair of baby because of bla bla bla reason. I am really shocked that how parents and people don’t understand that why to hurt baby’s head because our great great great grandparents believed it. I can see that very very educated parents still don’t think and use their mind. Oh are we really in 21st Century? Hey…. such an apt way of putting it. i have twin daughters and have chosen to not shave them. one of them has thick curly hair and the other has thin hair but they are slowly improving and i trust the science of good nutrition and genetics to help her better than traditions.